An ideal partner for lovers of speed, this beast comes equipped with forks and Öhlins shock absorber to ensure safety with speed. USP is the alluring Black theme and the Adjustable Öhlins suspensions. These coupled with the yellow central stripe fuel tank and matching front forks command an appeal matched by few on the road. The overall Black theme with yellow under panels is the true deal cracker. Power duties is performed by 1,079 cc L-Twin, Desmodromic distribution, 2 valves per cylinder, air cooled engine. It comes at a price tag ₹ 11.42 lakh (ex-showroom). The Scrambler 1100 Sport is the top-of-the-line model in the scrambler family. Not only the motorcycle packs the most powerful engine but also features more technology than other scramblers in the family. Here in India, this neo-retro performance naked is available to purchase at the price sticker of INR 11.42 lakh ex-showroom. Beneath the fuel tank, the Scrambler 1100 Sports a new L-Twin, Desmodromic distribution, 2 valves per cylinder, air cooled engine with the displacement of 1079 cc. Mated to a 6-speed gearbox unit, the motor is said to return the maximum power of 86 HP @ 7500 rpm along with 88 Nm of peak torque @ 4750 rpm. As expected, the bike is capable of returning fuel efficiency around 19.24kmpl. It is neo-retro performance naked which features a flat handlebar positioned upward. It along with higher seating and centre placed handlebar offers full control over the bike to cruise bike as you want. While the prominent fittings such as fatter tyres, new 45mm fully-adjustable upside-down forks and an IMU-equipped Bosch 9.1MP ABS system not only conveys a comfortable ride but also offers an overall control over the bike. Besides being powerful and technologically advanced, the top-of-the-line model, Scrambler 1100 Sport is a safe ride as well. The motorcycle rides on fat Pirelli tyres at both wheels and suspends over Ohlins sourced suspension setup which allows the rider to take on the bike on any terrain surfaces. Not even this, it features dual 320mm disc unit upfront from Brembo and a single 245mm disc at the rear wheel. The Bosch credited cornering ABS also works on both the wheels. 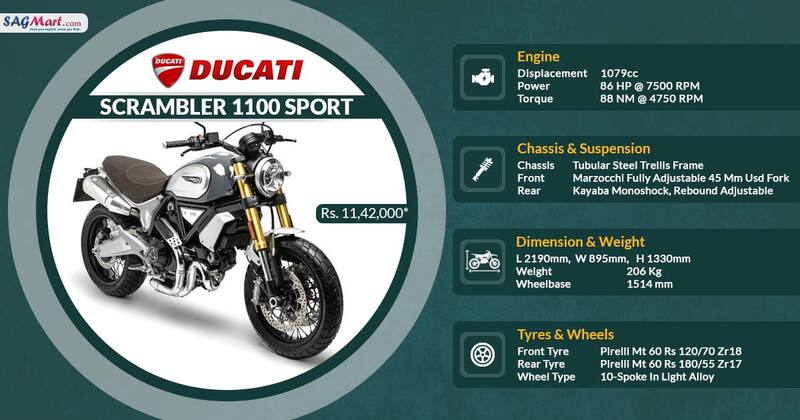 With a list of standout features such as LED lights, dual-purpose tyres, Brembo brakes, cornering ABS and Ducati Traction Control, the Scrambler 1100 Sports is an astounding neo-retro sport from Ducati. It gives the rider the freedom of taking the bike onto any kind of terrain surface.